Where did armadillos come from? An ancient Maya legend says that the first armadillos were created to teach a lesson in humility to a couple of minor gods. According to the legend, Hachakyum, the Maya Sun God, sat the two unruly deities down on a bench before all the other gods. The bench was suddenly transformed into a pair of armadillos, which immediately jumped up in the air — tumbling the two disobedient gods onto their backsides in disgrace. The British author Rudyard Kipling wrote in one of his “Just So Stories” for children that the armadillo was actually born out of an alliance between a turtle and a hedgehog. This tongue-in-cheek story explains that to escape the jaguar, the turtle taught the hedgehog how to be less prickly and more armored, and the hedgehog taught the turtle how to curl up into a protective ball. The end result was the first two armadillos, which thoroughly confused the hungry jaguar. We know today that armadillos are not turtles, hedgehogs, rabbits, or any cross between these animals. The armadillos belong to the order Cingulata, family Dasypodidae. Their closest living relatives are sloths and anteaters. 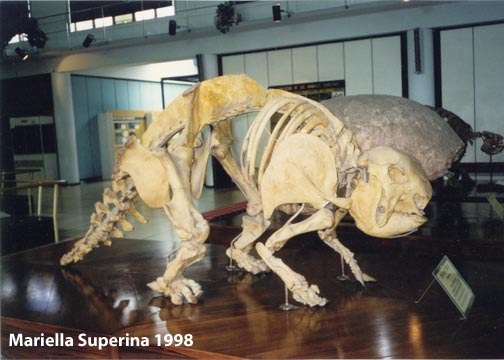 Together, armadillos (order Cingulata) and sloths and anteaters (order Pilosa) make up the superorder Xenarthra. These animals first evolved around fifty million years ago, in what is now South America. 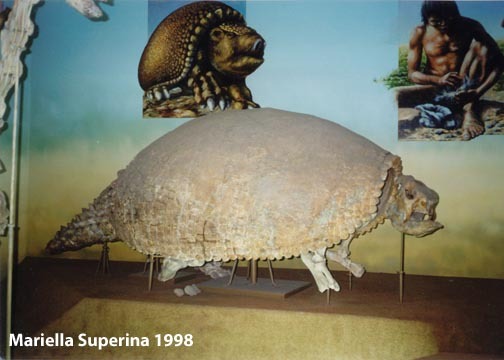 The earliest armadillo-like creatures were the glyptodon and the panocthus. 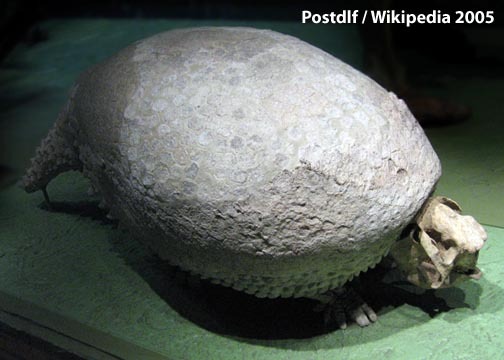 (If you have seen the movie Ice Age, you have probably seen a glyptodon, at least in cartoon form!) These animals were quite large, about the size of a Volkswagen Beetle. They were also very heavily armored. While modern armadillos have become much smaller, they do retain the shell that first appeared in these ancient armadillo relatives. Isolated from the rest of the world, and protected from predators with their bony armor, the armadillos flourished. They were relatively safe from predation; that is, until a land bridge developed between North and South America. Large canine and feline predators moved southward along this bridge, wreaking havoc on the native South American animals. Fossil records show that around seventy percent of the indigenous South American mammals were destroyed. The armadillos were not immune to these new and larger predators — although their shells are made of bone, they are rather thin — even a medium sized dog would have little trouble biting through. Despite all of the pressures caused by the influx of North American predators, the ever-resilient armadillo was not completely eradicated. In fact, the animals staged a counter-attack, moving northward as far as the Ohio river valley. The most widespread of these was the beautiful armadillo (Dasypus bellus), which was nearly identical to the modern nine-banded armadillo in appearance — except the beautiful armadillo was much larger, nearly three times the size of the nine-banded armadillo. Fossilized scutes (the bony plates that make up the shell) from the beautiful armadillo have been found throughout the midwestern United States. The beautiful armadillo held onto this territory until about eleven thousand years ago, when for unknown reasons all of the North American armadillo species became extinct. It was not until about 1850 that armadillos re-established themselves north of the Rio Grande. Since then, they have spread throughout the southeastern and midwestern United States, from North Carolina north to central Illinois, and as far west as New Mexico. Further northward expansion has been hampered by the animal’s low resistance to cold temperatures; they have almost no body fat reserves, and must forage for insects constantly. Cold weather means no food; no food means no armadillos. Even short periods of freezing temperatures can be fatal. However, they have had no problems with moving into warmer areas; current population estimates show between 30 to 50 million armadillos in the United States alone. For more information on the recent expansion of armadillos into the United States, see the Armadillo Expansion page. Twenty species of armadillo exist today. The most numerous one (and the only one found in the US) is the nine-banded armadillo (Dasypus novemcinctus). Others include the giant armadillo (Priodintes maximus), the tatouay (Cabassous tatouay), the six-banded armadillo (Euphractus sexcinctus), the three-banded armadillo (Tolypeutes tricinctus — the only armadillo that can actually roll itself into a ball), the little hairy armadillo (Euphractus vellerosus), and the pink fairy armadillo (Chlamyphorus truncatus). The endangered pink fairy armadillo has a very unusual shell. It is only attached to the animal along the spine, forming a sort of shield over the rest of the body. It also has an unusual tail, tipped with a shovel-like plate. This burrowing armadillo, with its large front feet and very hairy sides, resembles a cross between a mole and a scaly-backed pink caterpillar. For more information on these and other armadillos, see the Armadillo Species page. Links marked with this icon [ ] will leave this website.